Do you Decorate Outdoors for Fall & Halloween? Spice up your porch or door with a simple handmade wreath! It has just been this past year that I've gone all out for Fall & Halloween decorating outdoors. When I was working previously as the Craft Editor for a large publishing company, I honestly didn't have much time to decorate anything at home. When I did have the time, I was a little burnt out on making things for myself. Having to make and write about a large volume of crafts for multiple books and magazines at work shifted my personal hobbies to things like reading and exercise - anything but crafts. Not that this was a bad thing. However, it always surprised people when my house was, well, a little bland considering I was a Craft Editor. Now that I'm thankfully not on the payroll for a corporation to crank out hundreds of crafts a year, my personal passion for crafting is slowly coming back. I've had a fun time decorating my little house for Fall. From a handmade wreath for my back porch, to a weathered wood sign, to some simple 20 minute painted polka dot pots, each project has been much more joyful. No art directors demanding me to follow a particular style or managing editors tweaking my craft techniques or creative methods. I understand the necessity for all that in business, but as a very creative person, it can burn you out quickly having someone always critiquing and hovering over your shoulder with deadlines looming. I am extremely thankful to be crafting again just for the sake of making a cute little something for myself - or occasionally a family member, friend, my daughter's school or my local church. 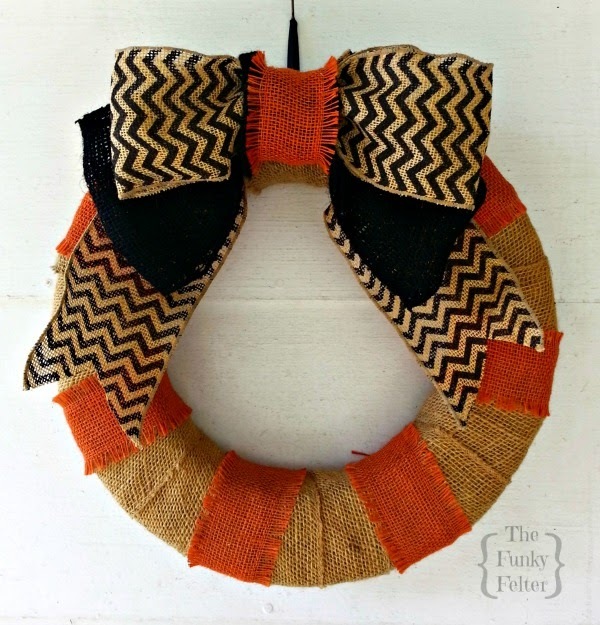 The handmade burlap and chevron wreath above was actually made last year. It was the one loner holiday decoration that I created for my own home around Halloween. It wasn't for any corporate publication and hung on my front door for several weeks. At the time, it made me so happy to see something I had made just for me, in my own style and on my own time. It still makes me happy to look at and now hangs just outside my front door. Although I used a regular Styrofoam wreath base for this one, you can find my tutorial on how to make 2 wreath bases from 1 pool noodle here. I'm all about saving a few bucks here and there where possible when crafting! Do you decorate for Fall and/or Halloween? Inside? Outside? Both? I certainly have had a blast doing all of that this year. I hope your Fall is going well so far!